On August 31st, I almost missed a show I was set to play. I had signed up to play a cool improv set with other peeps opening for the legendary Tetsuya Nakatani. I had gotten a response back but forgot to respond myself until a few days before. The day of the performance, I was really engrossed in Trigun and wanted to finish watching the remainder of the series. When I got home, something bolted into my mind, "hey! it's the day of that show!". The show was kind of secret, being a house show, so there wasn't a lot of notice for it either. I was so tired that day, but I had made the commitment and thought it would be fun. After a short rest, I did gather up my strength and instruments, decided on somewhat last minute, and headed over. I found my way to the house with assistance from a friend. I was just wandering around on the street outside, unsure of exactly where to go, until someone appeared out of a mysterious rift in the wall of houses. I felt great when I got into the courtyard; there was a calm semi-party atmosphere, and many of my friends were there. No one was that sure of who was playing as what; the consensus was that we were playing as a group. That's what we did. I think the improv group ended up being Micah Pacileo, Joey Molinaro, Dani Danger, Valerie Kuehne, Reid Magette, and myself. 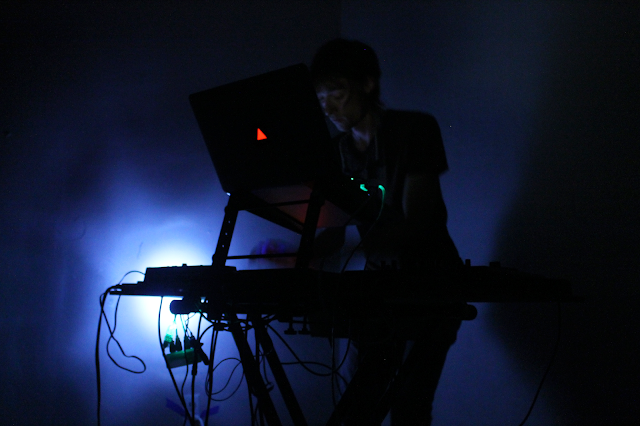 Instruments included theremin, piano, electric guitar, and my synthesizer, a microKORG. I was so engrossed in what I was doing that I didn't notice the trumpet(?) and vocals that I hear on the recording. It was fun and very disorganized. Though chaotic, I think that there was some sense to it, a gothic droney tone mixed with ragtime and jazz; it was not unlike Sun Ra's Arkestra. After listening to the recording, I was surprised that we only played for a little around 8 minutes. Sometimes, a short set is enough. I'd rather play shorter than go on for too long. Right afterward, I hurried over to a much eerier house for the next performer. Arvid Tomayko was set up in the corner of an otherwise empty room. We turned out the lights to strange sounds filling that space. Electrical whirrs met with the deep reverberations of caverns under the Earth. At times there was a sense of a beat. Everything was performed on custom equipment and using custom software on a laptop; I'm not sure what all it entailed. Tomayko ended just on time, almost going too long. Being in that room with a few others, not talking, connected by the oneness of sonic somethings was a very special experience. 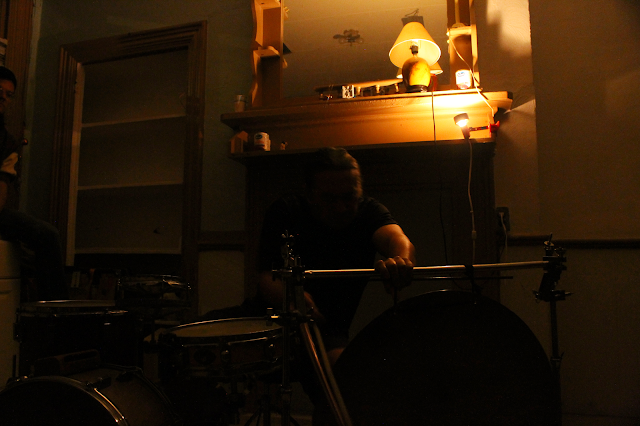 Then we went downstairs and watched as Tetsuya Nakatani set up his drumkit in a messy kitchen. Again, the room added to the ambiance of the performance. Nakatani played an apocalyptic piece of bowed gong and metal bowls. I was amazed at how nimble and precise he was with his improvisation. There were amazing sounds, very harsh and textural, the sounds of the roughness of metal objects along with an overarching doom of heavy drums. The eerie sounds of the gong worked with the stark lighting of that desolate place. This was the world and there was an outside of night time wonder where something, anything, might happen; we had entered the faerie realm. All of a sudden, it was over. We had returned to the Earth, a world of corporate villains masked as heroic leaders. The magick still lasted a while longer while I remained in that place with friends, but this was the real world. I will remember that sense of camaraderie from that day for a long time.